Yesterday, attempted to make this 15 minutes Aglio Olio pasta. 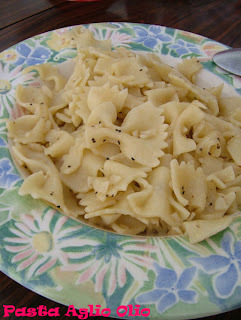 This is different from the cream-based pasta as Aglio Olio pastas are fried. Sooo I happened to read this recipe from a Malaysian's Women Weekly magazine, June 2006 issue. Decided to try it out. Took me quite awhile to get the ingredients ready as I had to boil the pasta, skin the garlic and chop them, and measure 100g of butter. Later, my mom helped with the garlic, while I boiled the pasta, and gotten the rest of the stuff on the cooking table. And then it begans. Melt butter, add ingredients, add pasta(after draining the water) then add some more ingredients. After that, I was supposed to toss the whole thing one last time, but being me, I tossed it till it was oily and dry. And you know what?